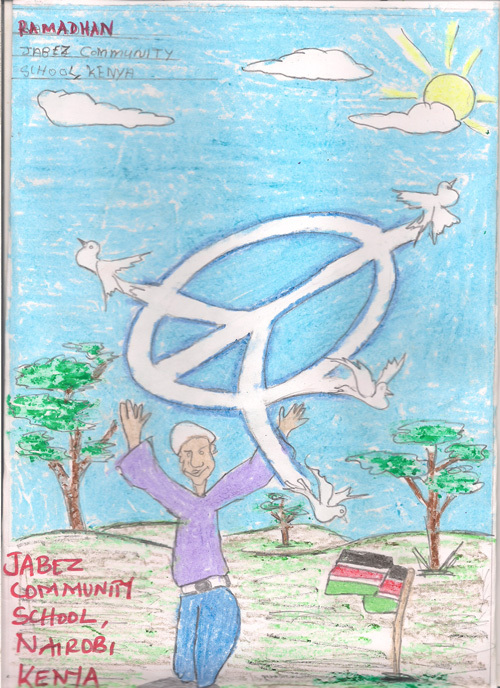 From Kenya we have received these designs from the Jabez Community School to join in the 2016 International Peace Quilt Project. This first design has been drawn by Emmanuel Nzioki and says: Having fun without anything dangerous happening around is a sign of peace. The next design is by Ishmael Oghari and says Peace in the World. Thank you to Head Girl, Betty for sending the designs through and to all the students involved from the Jabez Community Orphanage School. Additional thanks to Jabes Odhiambo for coordinating the project for Kenya. We are delighted to have you all included. The flag of Kenya consists of three horizontal stripes – the top stripe is black; the middle one is red; and the bottom stripe is green. The red stripe in the middle is bordered on the top and bottom by a thin white stripe. There is an emblem in the center of the flag that consists of a Masai warrior’s shield and spears. Pupils then took part in both the Stadion and Diaulos races. The closing ceremony included the presentation of certificates to winners and to all those who participated. This was followed by the national anthems of Greece (birthplace of the Olympic Games),Brazil (2016 host) and Japan (2020 host). Well done to all the pupils, staff and Head Frankline Zammit Galea for coordinating a wonderful and fun event. Schools’ International Peace Quilt invite schools worldwide to join together in an Olympic themed project called ‘Stride for Truce’. The aim of Stride for TRUCE is to mobilise children all over the world for the promotion of the Olympic ideals of building a better and more peaceful world. The date chosen for this event is June 16th or a date as close to this as best fits in with respective school calendars. The project style is based on past and present Olympic Races: 200 metres, 800 metres and 1500 metres taking the age of participants into account. Thank you so much to the students of St. Margaret Mary’s RC Primary School, Manchester UK for taking part in the 2016 Schools’ International Peace Quilt project. This first design has been drawn by Matthew Smith age 8 from year 3 who wrote: We all wish for peace because we want our world to be happy. The next drawing has been done by Amelia McCullum age 11. Amelia says: We all wish for peace because innocent people are dying every day. Thank you to M Hall and all the staff in St. Margaret Mary’s RC Primary School who helped coordinate the project in this school. The British flag was adopted on January 1, 1801, making it one of the oldest flags in the world. The first British flag dates back to 1606 when it combined the flags of the Kingdoms of England and Scotland. Northern Ireland’s flag of St. Patrick was added in 1801 and completed the flag as we know it today. Wales isn’t represented separately on the flag because it had already been united with England by the time the first flag was formed in 1606. The British flag’s more common name is the Union Jack. From Khazar University Dunya School in Azerbaijan we have received this lovely design created by Sitara Alizada in Grade 3. Sitara wrote: If we work as a team there will be peace and love everywhere. Thank you to Sitara who incidently produced this design in one day for the 2016 art project. Well done. Appreciation also to Rena Hasanova who helped us coordinate the project for Azerbaijan and without whose help and support we would not have representation for this country. The flag of Azerbaijan was officially adopted on February 5, 1991. After gaining its independence from the former Soviet Union in 1991, this flag, dating back to 1920, was hoisted for all to see. It features three equal horizontal bands of blue, red, and green. A crescent and eight-pointed star, symbols of Islam, are centered in the red band. The country had a long alliance with Turkey, and the blue color has long been associated with the Turkic peoples. Green is said to symbolize the strong European influences on local culture. We all want peace because it gives love no borders! We all wish for peace because… it is our only Future! We all wish for peace because we are humanity and humanity means every soul matters! We all wish for peace because it will help us get along and to stop fighting. A huge thank you to Tania Shah Povia for coordinating the 2016 Peace Quilt entries for Kuwait and to all the students involved. A special thanks also to the school Principal for allowing the school to participate. From Eritrea and the Semaetat Secondary school we have received this dual design. These two designs were drawn by two boys Danait Yosief age 10 and Haben Ressom age 11 and were joined as one so as to fit the A4 required size for the International Quilt. The above design was drawn by Hespon Goitom age 10. This school has done well in getting their submissions to us as they had no network in order to scan their drawings. The Headmaster went to the next village where he was able to capture the drawings by using a camera and sent them to us from there. Thank you so much to everyone for doing what they could to be involved no matter the barriers. The green stripe symbolizes the agricultural and livestock economy of Eritrea. The red stands for the blood shed during Eritrea’s struggle for independence. The blue represents the marine wealth while the yellow represents the mineral wealth of Eritrea. The olive wreath and branch on the flag originate from Eritrea’s first national flag which was used between 1952 and 1959. The olive wreath was adopted from the United Nations flag and symbolizes peace.